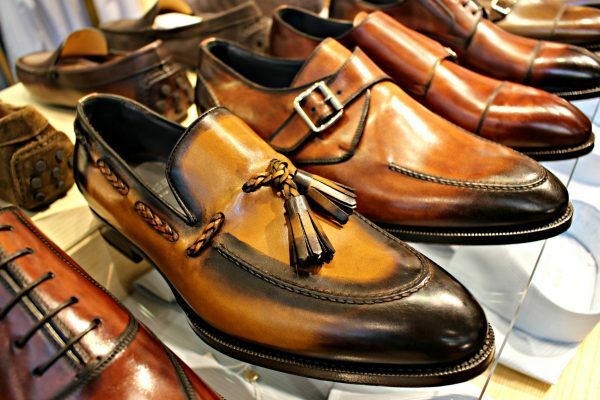 Scarpe di Bianco is a company composed of true artisans. Each pair of shoes is completely handmade with meticulous precision, taking much time to produce. Their production of each shoe is acutely artisanal in nature, witnessed by the fact that no more than 25 pairs are produced per day. From the burnishings of the leather to the final hand-sewn stitches, Scarpe di Bianco is nothing but authenticity. The finishing and burnishing of Di Bianco shoes are (arguably) what makes them so distinguishable. The company uses only the finest of colorants and polishes to finish their shoes. The burnishing of Di Bianco shoes is long and intensive, often requiring numerous different polishes and colorants to attain the final desired color. They even hand polish black calfskin. In fact, many colors offered are “Based on Black”, meaning that the shoe started as black calfskin, then underwent multiple treatments with different colorants and dyes to attain the final, finished product.